When we entered the site, we experienced a shock. Submenow.com's design is so cluttered and chaotic that it's tough to look. Everything is blinking and flashing, and it seems like a messy slot machine. The orange design feels childish. At the end of the main page you can find many advertisements that are not related to YouTube services, and therefore we thought they should remove the ads. The design is poor and cheap looking; we didn't like it and found it not user-friendly at all. This supplier's prices are quite fair. The prices for all the premium services are a little too low, which can raise suspicion regarding their services quality. We must say it was hard to understand their prices, mostly because there were too many deals and packages, and we felt everything is just so messy. Even now we're not sure how much you have to pay for everything separately. The experience is one big mess. If you want to pay this vendor, you can pay with PayPal, debit or via an online bank account. We cannot tell you what their refund policy is because every package has its own policy, and everything is phrased in such an unclear and confusing way. Trying to find help in the "help" page didn't answer our questions, either, but we'll elaborate more on that soon enough. The delivery speed was disappointing. We have to say that we expected a reasonable time but we received all the orders very quickly, and the views service especially was way too fast. They are definitely using an automated bot system. We don't recommend bot services because YouTube knows how to weed out the bots from the real users and they take severe actions against people using bots. There were lots of drops, especially in the views service. 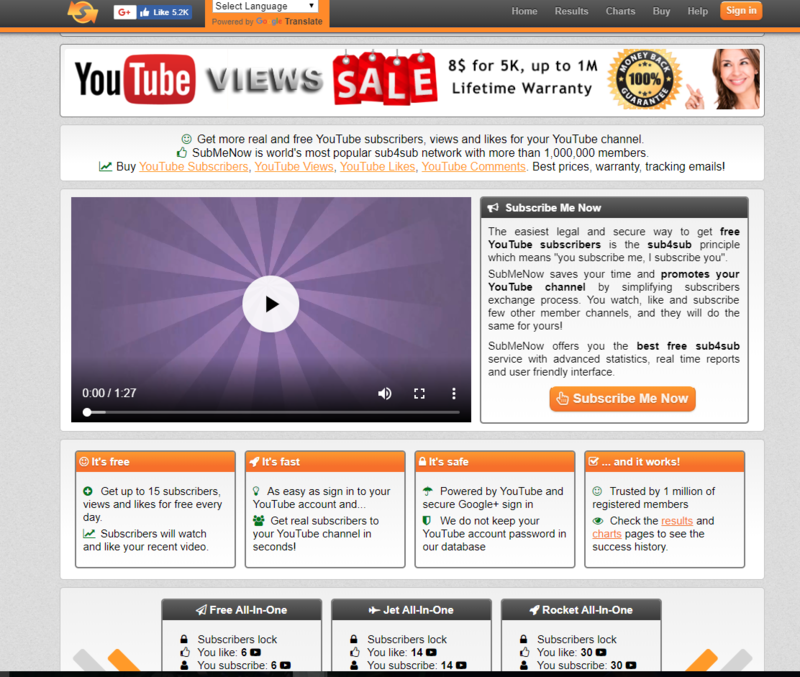 Submenow.com's views service dropped very fast, and most of the views dropped (about 3500 out of 5000). The sub4sub service mostly didn't drop (used the 'free' package). Unfortunately, I would not want to order from them again. The website features a help page that includes a list of structured questions with answers. In my eyes, like I said the design is visually messy, and the explanations are too wordy and not straight to the point. There is no option to send them a message through the site which I find less convenient, so if you need any help, you should contact them through your private email. I contacted customer service through an e-mail, and they answered after 24 hours. Compared to other sites, Submenow.com's services are very limited and so poorly written that we still don't know for sure what they're offering, exactly - plus the ads must be disabled; it's so annoying. Their overall services descriptions are written confusingly. We can't point out inaccuracies because we have no clue what we've read in the first place. We will give this vendor a decent score of 65 out of a 100. They have reasonable prices, and overall their services are quite good, although we couldn't understand what it is we were purchasing at first. Submenow.com's site design and their support and customer service are not as good (which is quite an understatement) and need improvement. It's okay for a one-time-only experience.